My only daughter was a sort of lab rat for me. Don’t get me wrong: I love her. But I was young, my head was full of theories about psycho-motor development and I was determined to break with all conservative ideas about child care. A whole new world of possibilities lay ahead and no blueprint available. She was a few weeks old and I spread a quilt over the living room’s carpet and lay her there. No boundaries between her and the Big Unknown. Soon I found out I was unprepared for her discoveries. She was less than three months old and I found her hanging from the leg hole in her baby buggy. I have no idea how this happened while I went to the kitchen grab something for a few minutes. No, I hadn’t, the kid was ok, no bruises. When she was about five months she would crawl all over the apartment on her elbows. Looked a little bit like a seal moving. That was also when she fell from her crib for the first time. I was in bed and heard a “thump” noise from her room, and then a hesitant complaining sound from her. She was sitting on the carpet, confused as she looked at me. No, I didn’t and no she hasn’t. Kids have very resistant skulls. 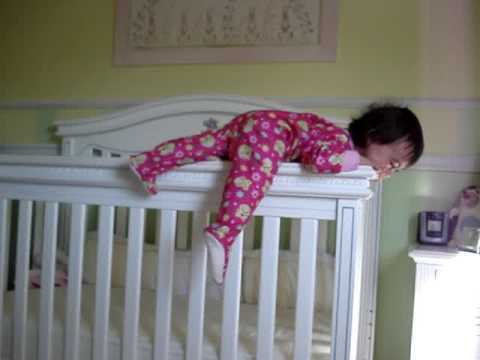 But she did pull herself up holding to the crib’s edge and then tumbled over and fell. That is the rule, and not the exception, among babies: they can lift themselves out of cribs easily, which means they can easily handle their bodyweight. I won’t lose your precious time revising for the nth time the literature according to which resistance training for kids is perfectly safe and healthy because this is not my objective with this article. I recommend a few good books in the end for those who wish to follow that route. My point here is that some of us are still unaware that our kids are innately strong – frequently, stronger than us and certainly stronger than all regular gym members we see every day. And some of us are still weary of allowing them into our world. My argument is: we shouldn’t. Their perception of us at the weight room is that we’re playing. We’re having fun. For dogs and kids, having fun is THE chief occupation. So they will not understand if they are not allowed to have fun the same way dad or mom do. The weight room is not safe at all for kids in general – they shouldn’t be allowed in just because people are not prepared to handle their total lack of fear and the way they will approach the objects around them with different perspectives. All the objects are uncodified for a kid with non-lifting parents. So, yes, it is a dangerous environment. But for powerlifting families, this is not the case: our kids were born and brought up aware that their parents play with those kinds of toys. The toys are familiar and they understand how “things work” in the weight room. I am not advocating early performance training for any child. Children should be allowed to build the widest possible set of motor skills and be introduced to as many sports as possible. However, keeping them out of our world due to some old fashioned and long discredited idea that “weight lifting is bad for their growth” may not only be illogical, uninformed but may also create a relationship problem that will sadly anticipate the inevitable estrangement they will need later on while building the foundations of their identity. You don’t want them to become teenagers that “don’t lift stupid weights like my dad does”. Let them be teenagers that won’t do the really stupid things you – and I, and everybody else – do. Let them be different by being better, and not depriving them from the one thing that you could offer them as a present for life. I teach middle school students, and their strength and resilience is often being WEAKENED by the adults in their lives purely for the adults convenience… not the way to raise thriving children!